Some guys are nice, and then there’s Mack. Something sinister lurks around Shady Ridge. It's places like this you can find easy prey. Mack Conway is a creep with an eye for the ladies. Life hasn't exactly been kind to him. It could be better if he just played nice, but he ain't nice… and he's looking for trouble. 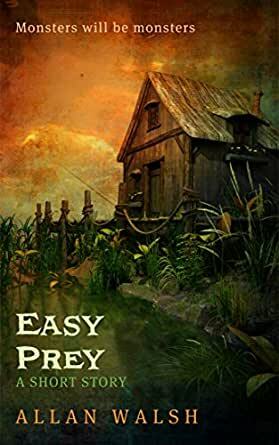 Easy Prey is a short horror story by Allan Walsh. If you like creepy chills, chilling creeps, and monsters lurking in hidden places, you’ll love this sinister little tale. Snare yourself a copy today! 4.0 out of 5 starsJust Who Is The Monster? A really enjoyable short story that leaves you pondering just who was really the monster of the tale. Wonderfully written with a comeuppance I fully didn't see coming and an ending that left you with a smile on your face. Judd has a bit to answer for I think. Extra kudos for the author being a fellow Australian, I look forward to reading more of his work. A really fine short story. Creepy and enjoyable. It makes me think twice about a midnight swim. Very well written. The pace gallops along. You have met characters like this and would wish for such a satisfying ending. I look forward to reading more by this author . This short story could be in any town Any where. You will enjoy the characters. The location is well described. This is a well-written story with a fantastic twist. I enjoyed the characters (even the baddies) and storyline kept me turning the pages. Having already read Allan Walsh’s “Blood Rage’ fantasy/adventure series, I was anxious to read something a little different from this author. “Easy Prey” was the perfect vehicle to accommodate that need. If you’ve not had the opportunity to read any of Allan’s work you are missing out on a pretty good reading experience. I find the short story format a wonderful way to get to know an author you’ve not read before or in this case read in a different genre. 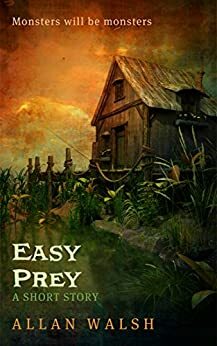 “Easy Prey” starts out with a “Grindhouse Horror” type feel to it. What you end up with is a good old fashioned, creepy, things that move in the night horror tale. An interesting and unique story with few, but interesting characters. I look forward to reading more from Allan Walsh. Allan Walsh is a writer and artist, born in Australia and raised in the suburbs of West London. He is the author of numerous horror and fantasy short stories and novels. From the back cover: Some guys are nice, and then there’s Mack. 5.0 out of 5 starsHaha! I like this story! I wish there really was a way to get real justice for people like Mack! He definitely deserved it! I definitely recommend reading this one! Creepy little tale, but I must confess, I kinda saw where it was going. Still, it was worth the read. Protagonist is genuinely creepy and uncomfortable to read about. Well written short story. 5.0 out of 5 starsSurprising twist! Surprising twist that had my mouth dropping open in shock! I wasn’t sure what to expect when I began this book. It was a quick read I finished in less than an hour. However, the author successfully induced very strong feelings of dislike, perhaps even hatred, from me over Mack. He is dangerous and every woman’s worst nightmare. Pure scumbag. Anyways, I was interested in the plot at all times and curious where the story was going. Then BAM! Out of nowhere the author sweeps the rug right from under you. It was an exciting and unexpected twist to this short story that has me still thinking about it hours after reading. I highly recommend this short story to fans of suspense who enjoy a good plot twist.